Award will be applied to the student's university student account to cover expenses incurred at USA, after all other institutional aid and awards have been applied. This will include application towards the cost of full-time resident tuition (15 credit hours per term at the College of Arts and Sciences published rate), USA housing (Epsilon I or II or Azelea Hall), and a USA meal plan (Jag Pass 175). 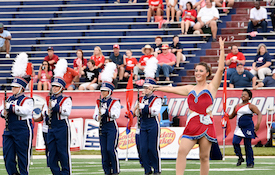 The University of South Alabama Jaguar Marching Band seeks a feature twirler beginning in the 2018-2019 academic year. The successful candidate must exhibit superior twirling abilities, perform as a first-class ambassador for the University of South Alabama, and be able to maintain excellent academic credentials throughout their career on our campus. The applicant selected for the position will be awarded a generous scholarship. The scholarship award will be applied to the student's university student account to cover expenses incurred at USA, after all other institutional aid and awards have been applied. This will include application towards the cost of full-time resident tuition (15 credit hours per term at the College of Arts and Sciences published rate), USA housing (Epsilon I or II or Azelea Hall), and a USA meal plan (Jag Pass 175). The award can be renewed yearly for up to four years with renewal based on the student maintaining the scholarship guidelines. 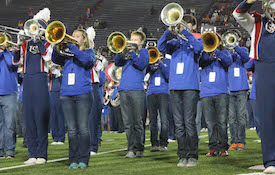 In addition, all equipment, uniforms, travel, and more are paid for by the University of South Alabama Jaguar Marching Band. You MUST be admitted to the University of South Alabama BEFORE you can apply for the feature twirler position. Applicants must submit a cover letter, resume of your twirling accomplishments, and a video compilation (uploaded either to YouTube or Google Drive) of themselves performing a solo field routine. The field routine video may be from two to four minutes long. This routine should be the first item on the video compilation submitted online. In addition, the video should include other examples of the applicant's competitive twirling appearances, as well as solo and parade performances they have given. The entire video compilation may not exceed 30 minutes. Applicants must be able to demonstrate a three turn, toss illusions, intermediate rolls, and multiple baton work. Applicants must also be able to to show the ability to travel across a large area, flexibility, showmanship, and a strong sense of teamwork. All video submissions become the property of the University of South Alabama and will not be returned to any applicant. By March 10, 2018, up to four finalists will be notified of their selection for an on-campus audition. The on-campus audition date will be April 14, 2018. Finalists should plan to arrive in Mobile on Friday, April 13th and depart on Sunday, April 15th. In any given year, the USA Jaguar Marching Band reserves the right to select no finalists and/or no feature twirler if no applicant is deemed qualified to serve as feature twirler of the Jaguar Marching Band. 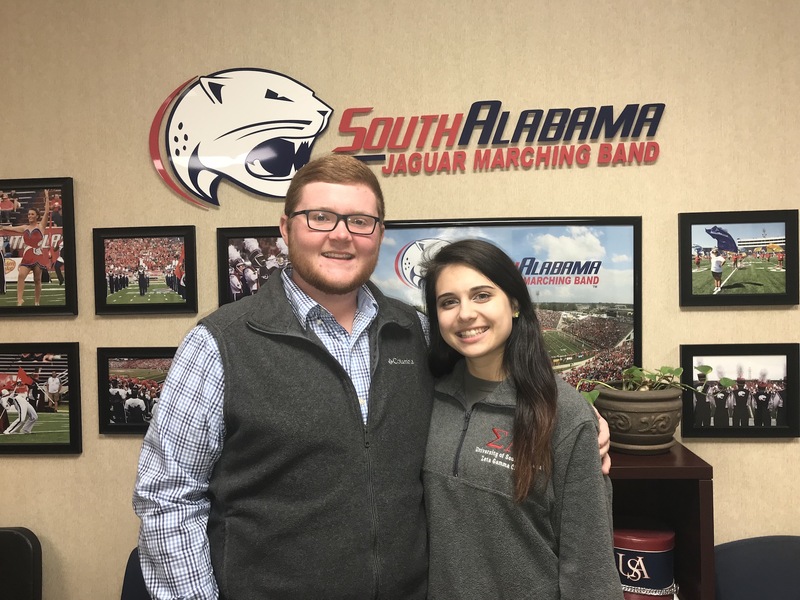 The University of South Alabama Jaguar Marching Band is an ensemble of over 250 select musicians, color guard, and a feature twirler. Housed in the Department of Music within the College of Arts and Sciences, the University's largest academic division, the Jaguar Marching Band serves as an ambassador for the University, a model of marching technique and instruction for the music education community, and a touchstone for Jaguar fans and alumni. The band is under the direction of Director of Bands at the University of South Alabama, Dr. William Petersen, Associate Director of Bands, Dr. Jason Rinehart, and Assistant Director of Bands, Mr. Matthew Greenwood. Since its founding in 1963, the University of South Alabama has offered a superb, well-rounded educational experience with high academic standards. USA’s fields of concentration are remarkably diverse, encompassing business, the liberal arts, education, engineering, computing, the sciences and health care. USA’s commitment to student success includes small class sizes and hands-on research opportunities in 100 undergraduate, graduate and doctoral degree programs. The undergraduate honors program for highly motivated and accomplished students includes course work and extracurricular activities throughout the four years of a student's undergraduate career. In health care, USA provides students with an exceptional medical education through the colleges of Medicine, Nursing and Allied Health Professions. At the same time, the USA Health System serves the region with advanced and innovative care through the USA Physicians Group, USA Medical Center, USA Children’s & Women’s Hospital and the USA Mitchell Cancer Institute. USA annually enrolls more than 16,000 students and has awarded 80,000 degrees in its 52-year history. The University’s Mitchell-Moulton Scholarship Initiative, a $25-million matching challenge, is strengthening USA’s commitment to expanding opportunities for current and future students.